Acute liver failure is an uncommon condition in which rapid deterioration of liver function results in coagulopathy, usually with an international normalized ratio (INR) of greater than 1.5, and alteration in the mental status (encephalopathy) of a previously healthy individual. Acute liver failure often affects young people and carries a very high mortality. The ultrasonogram shows a hyperechoic mass representing hepatocellular carcinoma. 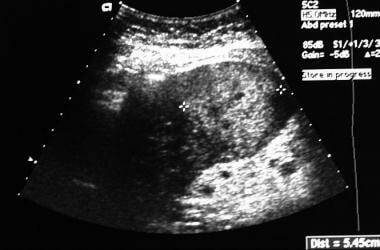 Ultrasonogram shows a hyperechoic mass representing hepatocellular carcinoma. Acute liver failure is a broad term that encompasses both fulminant hepatic failure and subfulminant hepatic failure (or late-onset hepatic failure). Fulminant hepatic failure is generally used to describe the development of encephalopathy within 8 weeks of the onset of symptoms in a patient with a previously healthy liver. Subfulminant hepatic failure is reserved for patients with liver disease for up to 26 weeks before the development of hepatic encephalopathy. The most important step in the assessment of patients with acute liver failure is to identify the cause, because certain conditions necessitate immediate and specific treatment and affect prognosis. All patients with clinical or laboratory evidence of moderate or severe acute hepatitis should have immediate measurement of prothrombin time (PT) and careful evaluation of mental status. The presence of PT prolongation or mental status changes is grounds for hospital admission. The most important aspect of treatment for acute liver failure is to provide good intensive care support, including protection of the airways. [1, 2, 3, 4, 5] Specific therapy is also dependent on the cause of the patient’s liver failure and the presence of any complications. Pay careful attention to the patient’s fluid management and hemodynamics. It is crucial to monitor their metabolic parameters, assess for infection, maintain nutrition, and promptly recognize GI bleeding. Various medications may be necessary because of the variety of complications that may occur from fulminant hepatic failure. In specific cases, antidotes that effectively bind or eliminate toxins are essential. Nonbiologic extracorporeal liver support systems, such as hemodialysis, hemofiltration, charcoal hemoperfusion, plasmapheresis, and exchange transfusions permit temporary liver support until a suitable donor liver is found. However, no controlled study has shown long-term benefit. Acute liver failure (ALF) is an uncommon condition in which rapid deterioration of the liver function results in coagulopathy and alteration in the mental status of a previously healthy individual. Acute liver failure often affects young people and carries a very high mortality. The term acute liver failure is used to describe the development of coagulopathy, usually with an international normalized ratio (INR) of greater than 1.5, and any degree of mental alteration (encephalopathy) in a patient without preexisting cirrhosis and with an illness of less than 26 weeks' duration. Acute liver failure is a broad term that encompasses both fulminant hepatic failure (FHF) and subfulminant hepatic failure (or late-onset hepatic failure). Fulminant hepatic failure is generally used to describe the development of encephalopathy within 8 weeks of the onset of symptoms in a patient with a previously healthy liver. Subfulminant hepatic failure is reserved for patients with liver disease for up to 26 weeks before the development of hepatic encephalopathy. Some patients with previously unrecognized chronic liver disease decompensate and present with liver failure; although this is not technically FHF, discriminating such at the time of presentation may not be possible. Patients with Wilson disease, vertically acquired hepatitis B, or autoimmune hepatitis may be included in spite of the possibility of cirrhosis, if their disease has been manifest for less than 26 weeks. The most important step in the assessment of patients with acute liver failure is to identify the cause, as certain causes demand immediate and specific treatment (see Workup). Drug-related hepatotoxicity, especially from acetaminophen, is the leading cause of acute liver failure in the United States (see Etiology). The most important aspect of treatment is to provide good intensive care support. Careful attention should be paid to fluid management and hemodynamics. Monitoring of metabolic parameters, surveillance for infection, maintenance of nutrition, and prompt recognition of gastrointestinal bleeding are crucial (see Treatment). Various medications may be necessary because of the variety of complications that occur from fulminant hepatic failure. In specific cases, antidotes that effectively bind or eliminate toxins are essential (see Medication). For patient education information, see the Infections Center and Digestive Disorders Center, as well as Hepatitis A (HAV, Hep A), Hepatitis B (HBV, Hep B), Hepatitis C (Hep C, HCV), and Cirrhosis. The development of cerebral edema is the major cause of morbidity and mortality in patients with acute liver failure. [10, 14, 15] The etiology of this intracranial hypertension (ICH) is not fully understood, but it is considered to be multifactorial. Briefly, hyperammonemia may be involved in the development of cerebral edema. Brain edema is thought to be both cytotoxic and vasogenic in origin. Cytokine profiles are also deranged. Elevated serum concentrations of bacterial endotoxins, tumor necrosis factor–alpha (TNF-α), interleukin (IL)–1, and IL-6 have been found in fulminant hepatic failure. Cytotoxic edema is the consequence of impaired cellular osmoregulation in the brain, resulting in astrocyte edema. Cortical astrocyte swelling is the most common observation in neuropathologic studies of brain edema in acute liver failure. In the brain, ammonia is detoxified to glutamine via amidation of glutamate by glutamine synthetase. The accumulation of glutamine in astrocytes results in astrocyte swelling and brain edema. There is clear evidence of increased brain concentration of glutamine in animal models of acute liver failure. The relationship between high ammonia and glutamine levels and raised ICH has been reported in humans. An increase in intracranial blood volume and cerebral blood flow is a factor in acute liver failure. The increased cerebral blood flow results because of disruption of cerebral autoregulation. The disruption of cerebral autoregulation is thought to be mediated by elevated systemic concentrations of nitric oxide, which acts as a potent vasodilator. Another consequence of fulminant hepatic failure is multisystem organ failure, which is often observed in the context of a hyperdynamic circulatory state that mimics sepsis (low systemic vascular resistance); therefore, circulatory insufficiency and poor organ perfusion possibly either initiate or promote complications of fulminant hepatic failure. The development of liver failure represents the final common outcome of a wide variety of potential causes, as the broad differential diagnosis suggests (see Differential Diagnosis). As with many drugs that undergo hepatic metabolism (in this case, by cytochrome P-450), the oxidative metabolite of acetaminophen is more toxic than the drug. [13, 16, 17, 18] The highly reactive active metabolite N-acetyl-p-benzoquinone-imine (NAPQI) appears to mediate much of the acetaminophen-related damage to liver tissue by forming covalent bonds with cellular proteins. Ordinarily, NAPQI is metabolized in the presence of glutathione to N-acetyl-p-aminophenol-mercaptopurine. Glutathione quenches this reactive metabolite and acts to prevent nonspecific oxidation of cellular structures, which might result in severe hepatocellular dysfunction. This mechanism fails in two different yet equally important settings. The first is an overdose (accidental or intentional) of acetaminophen. Acetaminophen ingestion of more than 10 g simply overwhelms the normal hepatic stores of glutathione, allowing reactive metabolites to escape. Numerous causes of fulminant hepatic failure exist, but hepatotoxicity due to acetaminophen and idiosyncratic drug reactions is the most common cause in the United States. For nearly 15% of patients, the cause remains indeterminate. Viral hepatitis may lead to hepatic failure. Hepatitis A and B account for most of these cases. In the developing world, acute hepatitis B virus (HBV) infection dominates as a cause of fulminant hepatic failure because of the high prevalence of the disease. Hepatitis C rarely causes acute liver failure. Hepatitis D, as a coinfection or superinfection with hepatitis B virus, can lead to fulminant hepatic failure. Hepatitis E (often observed in pregnant women) in endemic areas is an important cause of fulminant hepatic failure. Autoimmune hepatitis may also result in hepatic failure. Acute fatty liver of pregnancy (AFLP) frequently culminates in fulminant hepatic failure. AFLP typically occurs in the third trimester; preeclampsia develops in approximately 50% of these patients. AFLP has been estimated to occur in 0.008% of pregnancies. The most common cause of acute jaundice in pregnancy is acute viral hepatitis, and most of these patients do not develop fulminant hepatic failure. The one major exception to this is the pregnant patient who develops hepatitis E virus infection, in whom progression to fulminant hepatic failure is unfortunately common and often fatal. The exposure history in patients with hepatitis E is usually remarkable for travel and/or residence in the Middle East, India and the subcontinent, Mexico, or other endemic areas. In the United States, hepatitis E is relatively uncommon but must be considered in the appropriate setting. The HELLP (hemolysis, elevated liver enzymes, low platelets) syndrome occurs in 0.1-0.6% of pregnancies. It is usually associated with preeclampsia and may rarely result in liver failure. Many drugs (both prescription and illicit) are implicated in the development of fulminant hepatic failure. Drug-induced liver injury (DILI) is a leading cause of emergent liver transplantation  ; in Western nations, DILI is the primary cause of acute liver failure in adults. The more common agents are discussed below. Acetaminophen (also known as paracetamol and N-acetyl-p-aminophenol [APAP]) may lead to liver failure as a result of intentional or accidental overdose. In the US Acute Liver Failure (ALF) study, unintentional acetaminophen use accounted for 48% of cases, whereas 44% of cases were due to intentional use; in 8% of cases, the intention was unknown. Chronic alcohol use may greatly increase susceptibility to hepatotoxicity from acetaminophen because of depleted glutathione stores. Some patients with acute liver failure have unrecognized or uncertain acetaminophen toxicity. These cases have been diagnosed by highly specific acetaminophen-cysteine adducts assay. But this assay is currently not available for routine clinical use. Lo Re et al have proposed a new prognostic model to predict the risk of acute liver failure in patients with drug-induced liver injury that takes into consideration a patient's platelet count and total bilirubin level rather than the conventional use of alanine aminotransferase or aspartate aminotransferase and total bilirubin values used in Hy's law. They reported a high sensitivity of predicting acute liver failure with their model as compared with the low sensitivity but high specificity when Hy's law is used. More recently, researchers in the United Kingdom and Denmark developed a statistical outcome prediction model to support decision making in patients with acetaminophen-induced acute liver failure. Variables include patients’ age, Glasgow coma scale, arterial pH and lactate levels, creatinine levels, international normalized ratio, and cardiovascular failure, as well as changes in INR and lactate levels. A phalloides mushroom intoxication is much more common in Europe and in California than in the remainder of the United States. Miscellaneous causes of hepatic failure include adult-onset Still disease, heatstroke, and primary graft nonfunction in liver transplant recipients. In developed nations, acute liver failure has an estimated incidence of fewer than 10 cases per million people per year. Acetaminophen (paracetamol) overdoses are prominent causes of fulminant hepatic failure in Europe and, in particular, Great Britain. Hepatitis delta virus (HDV) superinfection is much more common in developing countries than in the United States because of the high rate of chronic hepatitis B virus (HBV) infection. Hepatitis E virus (HEV) is associated with a high incidence of fulminant hepatic failure in women who are pregnant and is of concern in pregnant patients living in or traveling through endemic areas. These regions include, but are not limited to, Mexico and Central America, India and the subcontinent, and the Middle East. Viral hepatitis E and autoimmune liver disease are more common in women than in men. In a US multicenter study group, acute liver failure was seen more often in women (73%) than in men, and women with acute liver failure were older (39 y) than men (32.5 y). Age may be pertinent to morbidity and mortality in those with acute liver failure. Patients younger than 10 years and older than 40 years tend to fare relatively poorly. Before the introduction of orthotopic liver transplantation (OLT) for fulminant hepatic failure, mortality was generally greater than 80%. Approximately 6% of OLTs performed in the United States are for fulminant hepatic failure. However, with improved intensive care, the prognosis is much better now than in the past, with some series reporting a survival rate of approximately 60%. The etiologic factor and the development of complications are the main determinants of outcome in acute liver failure. Patients with acute liver failure caused by acetaminophen have a better prognosis than those with an indeterminate form of the disorder. Patients with stage 3 or 4 encephalopathy have a poor prognosis. The risk of mortality increases with the development of any complications, which include cerebral edema, renal failure, adult respiratory distress syndrome (ARDS), coagulopathy, and infection. In patients with fulminant hepatic failure due to hepatitis A virus (HAV), survival rates are greater than 50-60%. These patients account for a substantial proportion (10-20%) of the pediatric liver transplants in some countries despite the relatively mild infection that is observed in many children infected with HAV. The outcome for patients with fulminant hepatic failure due to other causes of viral hepatitis is much less favorable. Fulminant hepatic failure due to acetaminophen toxicity generally has a relatively favorable outcome, and the prognostic variables permit reasonable accuracy in determining the need for OLT. Patients in deep coma (hepatic encephalopathy grades 3-4) on admission have a higher mortality than patients with milder encephalopathy. An arterial pH of lower than 7.3 and either a prothrombin time (PT) greater than 100 seconds or serum creatinine level greater than 300 mcg/mL (3.4 mg/dL) are independent predictors of poor prognosis. In patients who meet three or more of these criteria, preparations for OLT should be arranged. The above criteria were developed at King's College Hospital in London  and have been validated in other centers. However, significant variability occurs in terms of the patient populations encountered at any center, and this heterogeneity may preclude widespread applicability. Many other prognosticating tests have been proposed. The combination of reduced levels of group-specific component (Gc)-globulin (a molecule that binds actin) is reported in fulminant hepatic failure, [34, 35] and a persistently increasing PT portends death. These and other parameters have not been widely validated yet. Wilson disease that presents as fulminant hepatic failure is almost uniformly fatal unless the patient undergoes OLT. Paradoxically, rapid progression from the onset of jaundice (usually the first unequivocal sign of liver disease recognized by the patient or family) to encephalopathy is associated with improved survival. When this interval is less than 2 weeks, patients have hyperacute liver failure. Although the grade of encephalopathy is a prognostic factor in cases of acetaminophen overdose, it does not correlate with outcome in other settings. [Guideline] Lee WM, Larson AM, Stravitz RT. AASLD position paper: the management of acute liver failure: update 2011. Hepatology. Available at https://www.aasld.org/sites/default/files/guideline_documents/alfenhanced.pdf. 2011; Accessed: June 13, 2017. Lee WM, Stravitz RT, Larson AM. Introduction to the revised American Association for the Study of Liver Diseases position paper on acute liver failure 2011. Hepatology. 2012 Mar. 55 (3):965-7. [Medline]. [Full Text]. Stravitz RT, Kramer AH, Davern T, et al, for the Acute Liver Failure Study Group. Intensive care of patients with acute liver failure: recommendations of the U.S. Acute Liver Failure Study Group. Crit Care Med. 2007 Nov. 35 (11):2498-508. [Medline]. Bernal W. Intensive care support therapy. Liver Transpl. 2003 Sep. 9 (9):S15-7. [Medline]. Jalan R. Acute liver failure: current management and future prospects. J Hepatol. 2005. 42 suppl (1):S115-23. [Medline]. Sussman NL, Gislason GT, Conlin CA, Kelly JH. The Hepatix extracorporeal liver assist device: initial clinical experience. Artif Organs. 1994 May. 18 (5):390-6. [Medline]. Hughes RD, Williams R. Use of bioartificial and artificial liver support devices. Semin Liver Dis. 1996 Nov. 16 (4):435-44. [Medline]. Nyberg SL, Misra SP. Hepatocyte liver-assist systems--a clinical update. Mayo Clin Proc. 1998 Aug. 73 (8):765-71. [Medline]. Demetriou AA, Brown RS Jr, Busuttil RW, et al. Prospective, randomized, multicenter, controlled trial of a bioartificial liver in treating acute liver failure. Ann Surg. 2004 May. 239 (5):660-7; discussion 667-70. [Medline]. [Full Text]. Jalan R, Olde Damink SW, Deutz NE, Hayes PC, Lee A. Moderate hypothermia in patients with acute liver failure and uncontrolled intracranial hypertension. Gastroenterology. 2004 Nov. 127 (5):1338-46. [Medline]. Jiang W, Desjardins P, Butterworth RF. Hypothermia attenuates oxidative/nitrosative stress, encephalopathy and brain edema in acute (ischemic) liver failure. Neurochem Int. 2009 Jul-Aug. 55 (1-3):124-8. [Medline]. Hoofnagle JH, Carithers RL Jr, Shapiro C, Ascher N. Fulminant hepatic failure: summary of a workshop. Hepatology. 1995 Jan. 21 (1):240-52. [Medline]. Lee WM, Schiodt FV. Fulminant hepatic failure. In: Schiff ER, Sorrell, MF, Maddrey WC, eds. Schiff's Diseases of the Liver. 8th ed. Baltimore, Md: Lippincott Williams & Wilkins; 1999. Lidofsky SD, Bass NM, Prager MC, et al. Intracranial pressure monitoring and liver transplantation for fulminant hepatic failure. Hepatology. 1992 Jul. 16 (1):1-7. [Medline]. Detry O, Arkadopoulos N, Ting P, et al. Intracranial pressure during liver transplantation for fulminant hepatic failure. Transplantation. 1999 Mar 15. 67 (5):767-70. [Medline]. Schiodt FV, Rochling FA, Casey DL, Lee WM. Acetaminophen toxicity in an urban county hospital. N Engl J Med. 1997 Oct 16. 337 (16):1112-7. [Medline]. Larson AM, Polson J, Fontana RJ, et al, for the Acute Liver Failure Study Group. Acetaminophen-induced acute liver failure: results of a United States multicenter, prospective study. Hepatology. 2005 Dec. 42 (6):1364-72. [Medline]. Davern TJ 2nd, James LP, Hinson JA, et al, for the Acute Liver Failure Study Group. Measurement of serum acetaminophen-protein adducts in patients with acute liver failure. Gastroenterology. 2006 Mar. 130 (3):687-94. [Medline]. Khandelwal N, James LP, Sanders C, Larson AM, Lee WM, Acute Liver Failure Study Group. Unrecognized acetaminophen toxicity as a cause of indeterminate acute liver failure. Hepatology. 2011 Feb. 53 (2):567-76. [Medline]. Liu J, Ghaziani TT, Wolf JL. Acute fatty liver disease of pregnancy: updates in pathogenesis, diagnosis, and management. Am J Gastroenterol. 2017 Jun. 112 (6):838-46. [Medline]. Alempijevic T, Zec S, Milosavljevic T. Drug-induced liver injury: do we know everything?. World J Hepatol. 2017 Apr 8. 9 (10):491-502. [Medline]. Biolato M, Araneo C, Marrone G, et al. Liver transplantation for drug-induced acute liver failure. Eur Rev Med Pharmacol Sci. 2017 Mar. 21 (1 suppl):37-45. [Medline]. Marrone G, Vaccaro FG, Biolato M, et al. Drug-induced liver injury 2017: the diagnosis is not easy but always to keep in mind. Eur Rev Med Pharmacol Sci. 2017 Mar. 21 (1 Suppl):122-34. [Medline]. Paterson JM, Mamdani MM, Manno M, Juurlink DN, Canadian Drug Safety and Effectiveness Research Network. Fluoroquinolone therapy and idiosyncratic acute liver injury: a population-based study. CMAJ. 2012 Oct 2. 184 (14):1565-70. [Medline]. Centers for Disease Control and Prevention (CDC). Notes from the field: acute hepatitis and liver failure following the use of a dietary supplement intended for weight loss or muscle building--May-October 2013. MMWR Morb Mortal Wkly Rep. 2013 Oct 11. 62 (40):817-9. [Medline]. [Full Text]. Hand L. CDC: supplement linked to hepatitis, liver failure. Medscape Medical News. October 15, 2013. [Full Text]. Lo Re V 3rd, Haynes K, Forde KA, et al. Risk of acute liver failure in patients with drug-induced liver injury: evaluation of Hy's law and a new prognostic model. Clin Gastroenterol Hepatol. 2015 Dec. 13 (13):2360-8. [Medline]. Bernal W, Wang Y, Maggs J, et al. Development and validation of a dynamic outcome prediction model for paracetamol-induced acute liver failure: a cohort study. Lancet Gastroenterol Hepatol. 2016 Nov. 1 (3):217-25. [Medline]. Klein AS, Hart J, Brems JJ, Goldstein L, Lewin K, Busuttil RW. Amanita poisoning: treatment and the role of liver transplantation. Am J Med. 1989 Feb. 86 (2):187-93. [Medline]. Ichai P, Samuel D. Epidemiology of liver failure. Clin Res Hepatol Gastroenterol. 2011 Oct. 35 (10):610-7. [Medline]. Bernal W, Wendon J. Acute liver failure. N Engl J Med. 2013 Dec 26. 369 (26):2525-34. [Medline]. Hoyer DP, Munteanu M, Canbay A, et al. Liver transplantation for acute liver failure: are there thresholds not to be crossed?. Transpl Int. 2014 Jun. 27 (6):625-33. [Medline]. O'Grady JG, Alexander GJ, Hayllar KM, Williams R. Early indicators of prognosis in fulminant hepatic failure. Gastroenterology. 1989 Aug. 97 (2):439-45. [Medline]. Lee WM, Galbraith RM, Watt GH, et al. Predicting survival in fulminant hepatic failure using serum Gc protein concentrations. Hepatology. 1995 Jan. 21 (1):101-5. [Medline]. Schiødt FV, Rossaro L, Stravitz RT, Shakil AO, Chung RT, Lee WM, et al. Gc-globulin and prognosis in acute liver failure. Liver Transpl. 2005 Oct. 11 (10):1223-7. [Medline]. [Guideline] Chalasani NP, Hayashi PH, Bonkovsky HL, Navarro VJ, Lee WM, Fontana RJ, et al. ACG clinical guideline: the diagnosis and management of idiosyncratic drug-induced liver injury. Am J Gastroenterol. 2014 Jul. 109 (7):950-66; quiz 967. [Medline]. [Guideline] European Association for the Study of the Liver. Electronic address: easloffice@easloffice.eu. EASL clinical practical guidelines on the management of acute (fulminant) liver failure. J Hepatol. 2017 May. 66 (5):1047-81. [Medline]. [Full Text]. Kelly JC. Drug-induced liver injury guidelines released by ACG. Medscape Medical News. June 18, 2014. June 24, 2014. [Full Text]. Rolando N, Harvey F, Brahm J, et al. Fungal infection: a common, unrecognised complication of acute liver failure. J Hepatol. 1991 Jan. 12 (1):1-9. [Medline]. Murphy N, Auzinger G, Bernel W, Wendon J. The effect of hypertonic sodium chloride on intracranial pressure in patients with acute liver failure. Hepatology. 2004 Feb. 39 (2):464-70. [Medline]. Pereira SP, Langley PG, Williams R. The management of abnormalities of hemostasis in acute liver failure. Semin Liver Dis. 1996 Nov. 16 (4):403-14. [Medline]. Stine JG, Lewis JH. Current and future directions in the treatment and prevention of drug-induced liver injury: a systematic review. Expert Rev Gastroenterol Hepatol. 2016. 10 (4):517-36. [Medline]. [Guideline] Murray KF, Carithers RL Jr, AASLD. AASLD practice guidelines: Evaluation of the patient for liver transplantation. Hepatology. 2005 Jun. 41 (6):1407-32. [Medline]. [Guideline] Martin P, DiMartini A, Feng S, Brown R Jr, Fallon M. Evaluation for liver transplantation in adults: 2013 practice guideline by the American Association for the Study of Liver Diseases and the American Society of Transplantation. Hepatology. 2014 Mar. 59 (3):1144-65. [Medline]. [Full Text]. [Guideline] Squires RH, Ng V, Romero R, et al. Evaluation of the pediatric patient for liver transplantation: 2014 practice guideline by the American Association for the Study of Liver Diseases, American Society of Transplantation and the North American Society for Pediatric Gastroenterology, Hepatology and Nutrition. Hepatology. 2014 Jul. 60 (1):362-98. [Medline]. [Full Text]. [Guideline] Lucey MR, Terrault N, Ojo L, et al. Long-term management of the successful adult liver transplant: 2012 practice guideline by the American Association for the Study of Liver Diseases and the American Society of Transplantation. Liver Transpl. 2013 Jan. 19 (1):3-26. [Medline]. [Full Text]. [Guideline] Kelly DA, Bucuvalas JC, Alonso EM, et al, for the American Association for the Study of Liver Diseases, American Society of Transplantation. Long-term medical management of the pediatric patient after liver transplantation: 2013 practice guideline by the American Association for the Study of Liver Diseases and the American Society of Transplantation. Liver Transpl. 2013 Aug. 19 (8):798-825. [Medline]. [Full Text]. ClinicalTrials.gov. Comparison of two extracorporeal liver support system (with or without recirculation): MARS (Molecular Adsorbents Recirculating System) versus SPAD (Single Pass Albumin Dialysis) in severe liver failure. Available at https://clinicaltrials.gov/ct2/show/NCT02310542. Accessed: June 5, 2017. The effect of Prometheus liver support dialysis on cerebral metabolism in acute liver failure. ClinicalTrials.gov. Available at http://clinicaltrials.gov/ct2/show/NCT00655304. Accessed: August 30, 2011. Fontana RJ, Ellerbe C, Durkalski VE, et al; for the US Acute Liver Failure Study Group. Two-year outcomes in initial survivors with acute liver failure: results from a prospective, multicentre study. Liver Int. 2015 Feb. 35 (2):370-80. [Medline]. Fairfield C, Penninga L, Powell J, Harrison EM, Wigmore SJ. Glucocorticosteroid-free versus glucocorticosteroid-containing immunosuppression for liver transplanted patients. Cochrane Database Syst Rev. 2015 Dec 15. 12:CD007606. [Medline]. Subacute subdural hematoma with extension into the anterior interhemispheric cistern. Note that the sulci do not contain the spread of these hemorrhages. Fast Five Quiz: What Do You Know About Hyponatremia?